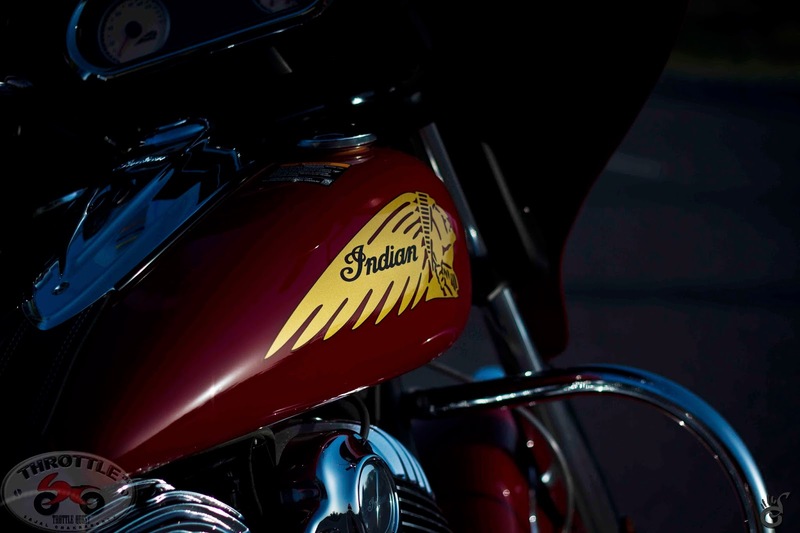 Well, the Indian Chieftain has such an immense presence, character and aura that probably one article cannot do justice. After our first India Ride Review of the Indian Chieftain, here's what this motorcycle feels like at a more personal level, a level which is above the general norms of technicality, serious thoughts and interpretations. 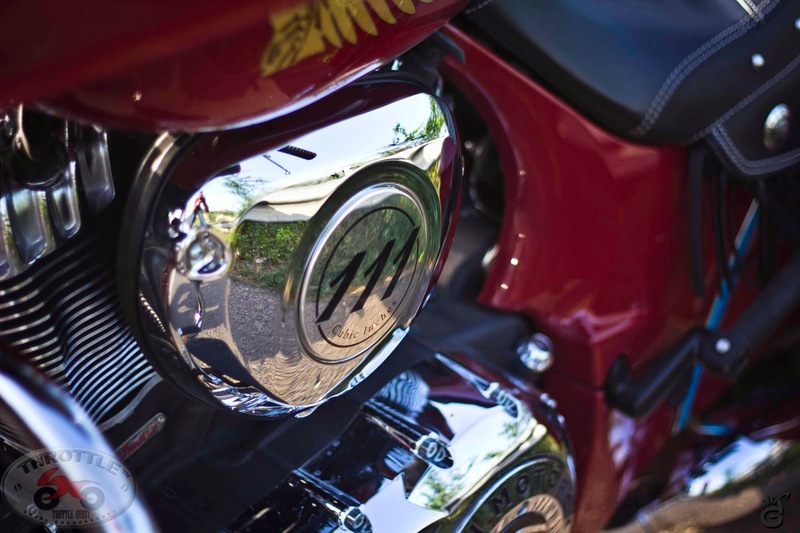 So, read along, as to how a day to day rider would connect to this bohemian behemoth on two wheels - The Indian Chieftain. The Chieftain makes its presence felt like all big motorcycles. There are two ways you would notice such a big motorcycle on the road, by the sound of it if you aren’t looking or by simply noticing the unusually large dimensions in the typical Indian traffic. This comes in the latter category as the sound coming out of the stock exhausts is sublime, gentle, un-intimidating and fairly smooth. It’s big and it’s beautiful. This is the Indian Chieftain. 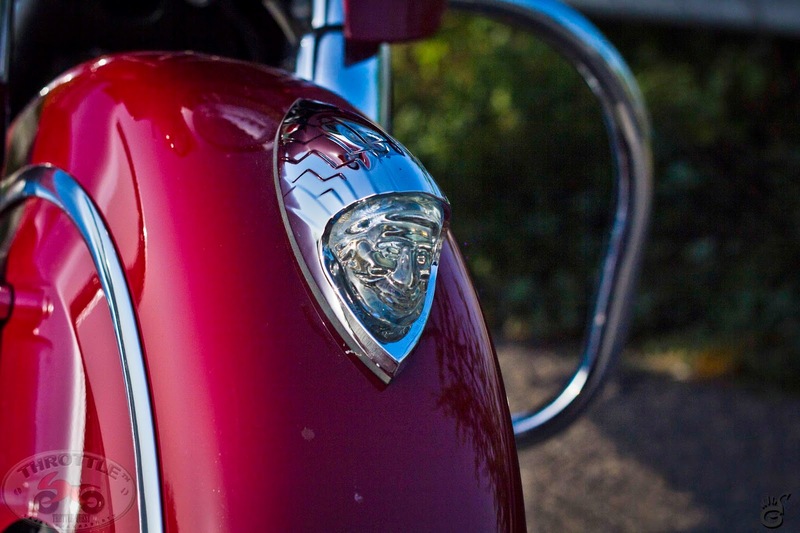 Indian Motorcycles, an American company, was originally founded in 1897 to produce bicycles. It was in 1901 that the first single cylinder engine was developed and put into production. In 2011, Indian Motorcycles was acquired by Polaris Industries which also owns Victory Motorcycles (another American company). 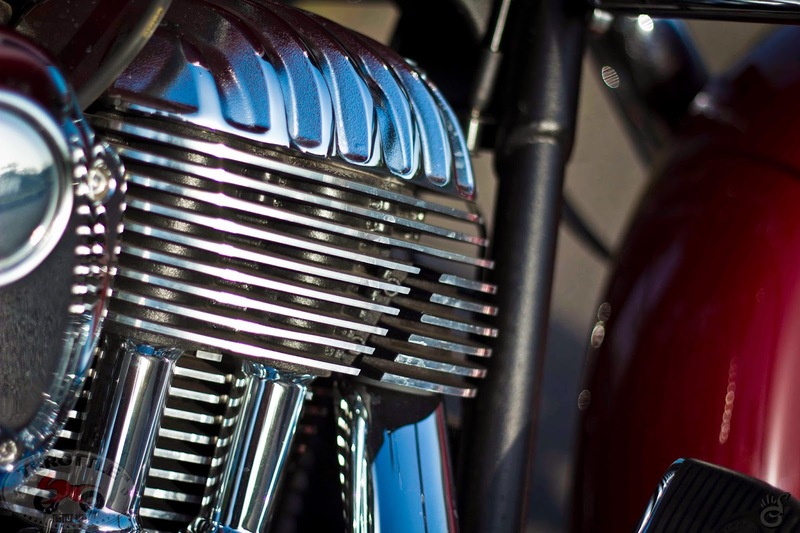 In March 2013, Indian introduced the brand new Thunder Stroke 111 cubic-inch engine and the Chieftain is one of the three motorcycles that have come out with this engine. The Chieftain is the touring variant with the front fairing and hard saddle bags. The other two variants are Chief Classic and Chief Vintage. The Chief Classic is a bare cruiser with no saddle bags and any wind protection and the Chief Vintage has a wind shield and leather saddle bags. The basic design of all three motorcycles is based on the traditional Indian styling and they share the Thunder Stroke engine. These are the first all new motorcycles from Indian since the acquisition by Polaris Industries. And we are here to talk about the Chieftain. Let’s start with the look and appearance. It’s a big motorcycle and the bulk is enhanced by the front full fairing and hard saddle bags. The design is very neat, uncomplicated and smooth with flowing curves. The front fairing is handle bar mounted so that it moves left/right with the handle and wide enough to protect the rider from the weather but still doesn't look unreasonably bulky. The motorcycle has the trademark valenced fenders and the overall design is very proportionate. The seats are made of high quality leather and are extremely comfortable to sit on. The meter console is beautiful with a simple design and the numbers are legible to read. The Chieftain comes with standard ABS, keyless ignition, closed loop fuel injection, six speed gearbox, tyre pressure sensors, music system with AM/FM and integrated Bluetooth and cruise control. It’s a cruiser based on Indian’s traditional styling but every bit modern when it comes to engineering and equipment. The frame is cast aluminium! It scales at 385 kilos fully fuelled. On my small first ride of the Chieftain, I found it to be surprisingly lighter to handle in normal traffic and to manoeuvre. It does feel heavy when it is lifted from the side stand but once on move, the weight virtually disappears. This is very impressive especially to me as I am around 5 feet 7 inches tall and weigh around 71 kgs. So I am not a big guy. Firing up the engine produces a sedate, consistent and smooth exhaust note and is quite understated from the 1811 cc engine. And here I would like to point out how visually beautiful the engine looks. I didn’t mention it earlier because I wanted to make it special. The engine is air cooled and is a piece of art. 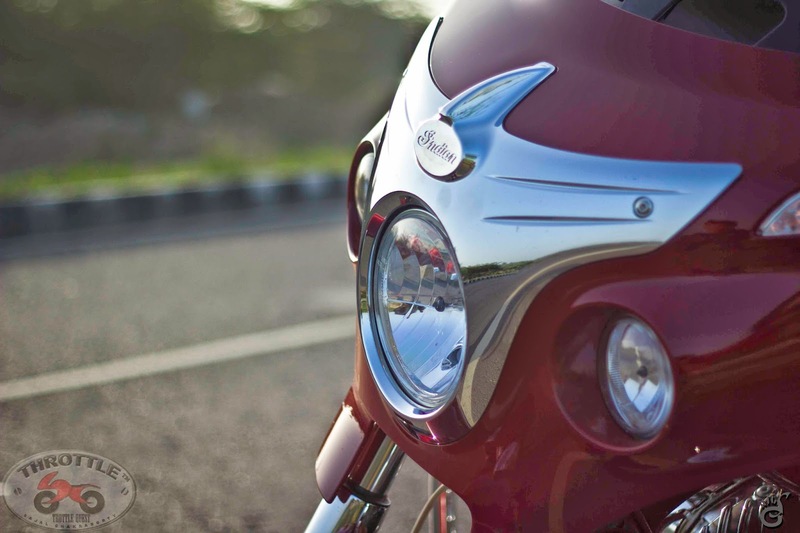 It’s beautiful to look at and is probably the most visually stunning thing on the motorcycle! It’s big, finished in chrome and exudes quality. It starts with a gentle v-twin sound and at first it might actually sound a bit underwhelming for its size. Like the consistent exhaust note, the Chieftain is very smooth motorcycle to ride. I didn’t experience any vibrations though my time with the bike wasn’t long enough to experience the range of speeds it’s capable of doing. But the first impression on smoothness is very positive. The ride quality is equally impressive, the motorcycles flows. The handling and stability inspires confidence in the rider. The approach to riding such a motorcycle should be different than most other motorcycles. Irrespective of the excellent handling prowess, there needs to be a smooth and calm effort towards handling this gentle giant. On the turns or transitioning to either side, the Chieftain is smooth and reassuring. It’s like meditation. It’s a very special feeling for me to ride a Chieftain even for a very short duration. In those couple of kilometres or so, I tried to absorb everything that I was feeling in the ride. It was quite something. Motorcycles like the Chieftain aren't primarily about acceleration. They provide a different experience and are meant to cover great distances in great comfort. This is the Indian Chieftain. Thanks to Indian Motorcycles Gurgaon and Mr. Mohit Agarwal for providing us this wonderful work of art and engineering.